We will begin updating the website with new information as we have it, so be sure to check back here, on the new Capital Campaign section of our weekly email, as well as Facebook for the most up to date information. As part of the Youth Team's efforts to get our students involved in the capital campaign, we invite the entire congregation to participate in a friendly game of "PENNY WARS." Place a penny in the "BOYS" or "GIRLS" container to earn a point for one of the teams. Place silver change or dollars in the opposing team's container to subtract points from their total. For example, 25 pennies in a container would equal 25 points for that team but a quarter placed in a container will take away 25 points from that team's total. The team with the highest point total at the end is the winner. Team leaders are Chris Mattson and Kate Kielion. The losing team leader will get a pie to the face at the end of the competition. All funds raised will go toward the youth contribution to our capital campaign. Led by Amy Churchill and Anja Armitage, will give an update on their team's work during the announcement portion of the services, Sunday, February 24th. The Penny War is going strong and is creating lots of interest and enthusiasm with all ages. The Youth Team, however, has other projects to engage the children and youth in learning more about stewardship. 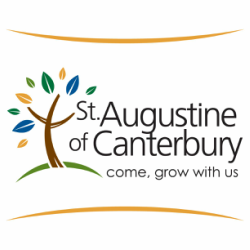 The children and youth are a top priority to St. Augustine, and we look forward to hearing more from the Youth Team Sunday, February 24th. Anja and Amy, spoke with Sunday School Youth about what they may like to do to take part in the Capital Campaign. With the money they earn they will be able to purchase something for the new building. The kids were very creative and had many ideas, some practical like a stained glass window and some not so practical like an indoor pool! Their first fundraiser this year will be the pancake feed on March 3rd. They have decided to dedicate the proceeds to the youth portion of the Capital Campaign. The main difference you may notice this year will be that you will see the younger youth also helping out that day! So come out and enjoy breakfast after every service March 3rd!! Each of the campaign teams will give a congregational update on a specific Sunday this Spring. We thank the many volunteers who are already actively serving on the campaign teams.